← Seasonal influenza vaccination for professional athletes – who’s for the jab? There are a wide variety of healthcare professionals working in the sports medicine environment, whether that be in primary or secondary care, or within a sports team. These might typically include physiotherapists, physicians, massage therapists, strength and conditioning coaches, nutritionalists, biomechanicists, sports psychologists and others. 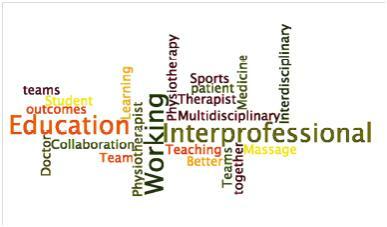 Most of us working as healthcare professionals in a sports medicine environment are no strangers to the multidisciplinary team way of working, but how often do we think about how we learn together, and from each other, in teams? The unique concept of IPE is one of deliberately bringing together a group of heterogeneous healthcare practitioners to discuss educational topics. As a consequence of this, it is hoped that the diversity amongst the group together with effective knowledge sharing will allow for better learning for all within the group. Hopefully, this goes on to lead to improved patient care and patient outcomes. IPE approaches to learning have been studied extensively, and Freeth (5) noted that some have indeed led to improved outcomes for patients, including improved preventative care, screening effectiveness and immunisation rates (1), improved teamwork and less perceived errors occurring in an emergency department (2), and increased interprofessional participation in planning and reviewing care (3, 4). However, there is a paucity of research on the implementation of IPE in a sports medicine environment, let alone on whether it leads to the outcomes we all desire for our patients and for our teams. Whilst IPE can be delivered in formal settings, it is perhaps the informal settings where its practicability can be demonstrated., for example, during MDT assessments of athletes with injuries where complex contributing factors need to be assessed as part of the overall picture. Most of us involved in sports medicine will be familiar with MDT assessment in this way, and if an effective learning environment is created, then this represents a wonderful opportunity for each of the participants to learn from each other. I wonder how often we consciously think of MDT assessments as a real opportunity for learning, and treat them as such? There are a number of possible barriers to the implementation of effective IPE. These include tensions between different professional groups such as negative stereotypes, status or salary differences, and demotivating and derogatory feedback between groups within the learning environment. To some extent, these barriers can be avoided if one adopts appropriate ground rules. As mentioned by Freeth (5), these might be extrapolated from the ‘Contact hypothesis’ which suggests that one can reduce hostility amongst different groups by creating a learning environment where everyone has equal status, interaction is co-operative, participants are working towards a common goal, the ‘authorities’ support the initiative (eg Club management and Professional bodies), participants are made aware in advance of each others’ differences and similarities, participants share positive expectations, and participants from different groups perceive each other as typical of their group (6). The extent to which these precedents are achievable is open for debate, and one might question whether with the wide range of healthcare practitioners involved in Sport and Exercise Medicine this might ever be achieved, or might even be desirable. It is not uncommon to experience formal and informal IPE in the sports medicine environment, whether that may be at conferences, as part of social learning platforms such as blogs and twitter feeds, or within the workplace. In addition, formal postgraduate degree courses such as the MSc in Sport and Exercise Medicine at William Harvey Research Institute, Queen Mary University, London which I lead often have a student base made up of a wide complement of healthcare practitioners who participate and learn from each other. This is regarded as a real strength of the course. CJSM would like to hear your views on IPE in the world of Sports Medicine– does it work for you, your colleagues, and perhaps more importantly for your patients? I think teamwork is increasingly a challenge to realise (in pretty much any social environment or community of practice), especially because of the widespread and predominant culture of competition that encourages and rewards individualism, usually at the expense of collaboration… “what gets measured, gets done”. I couldn’t help noticing that both the barriers mentioned and the “solutions” suggested mostly involved “individual” rather than organisational or “structural” dimensions – if the “work environment” talks about teams but measures and rewards/punishes individuals, I suspect collaboration will remain “good in theory” but rarer in practice. A coach can make teamwork a priority by establishing a culture that continually puts the team first, and as the old saying goes, “a champion team beats a team of champions” – its all in how well the parts interact to serve the whole, so the whole is more than the sum of the parts. Generally this requires that the reinforcements and rewards for the team exert a greater influence over time than those for the individuals. I hope to see interested athletes participating here and educating one another about how to best keep up with their busy activity schedules and prevent injuries. The more we educate one another, the better chance we have of keeping our bodies in top shape and avoiding the causes that lead to major sports injuries. I do not practice in a sports medicine setting, I practice at a small hospital as a Clinical Nurse Specialist (CNS). At first glance, I totally missed the point of this blog. I thought of all of the formal training and education that “taught” me how to communicate within a team. In fact, as a CNS, forming and leading multidisciplinary teams is second nature. What is being asked is how do we “learn” rather than merely “functioning” in a team setting. Learning/teaching is about transfer/reception of information/ideas/behaviors via written, verbal and observable means. How much learning can take place if we have fundamental difficulties with communication? It is not a damnation of healthcare, but I think it is an important question to ask. I think what is so interesting and exciting is incorporating patients into the team. While input from different disciplines and specialists is important, not including patients leads to readmissions, morbidity and a decrease in patient satisfaction. Patients and team members share much in common, namely important information but also an inherent desire to be recognized and included in treatment plans.